These “frachos” are my take on traditional nachos, but instead of using nacho chips, we’re using fries…get it? French fry nachos…Fr-achos? LOL–OK, maybe I’m the only one laughing. Anyway, and let’s be honest, if there’s two things that make everything better it’s French fries and steak, right? These frachos have an Argentinian flare, because we’re topping them with fresh and flavorful chimichurri. These are perfect for a late night snack or for a game day appetizer with a cold beer. 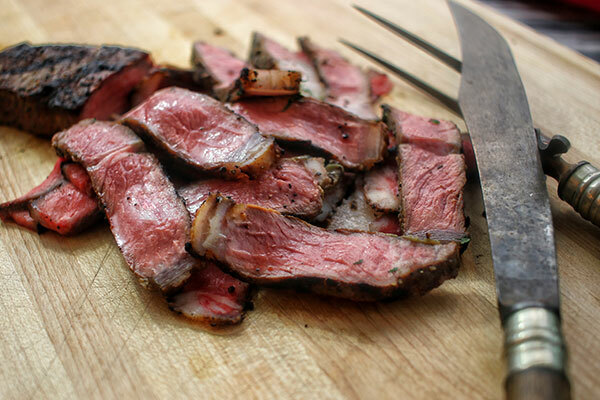 I’ve made this recipe using leftover steak because I get asked all the time about the best uses for left over beef, but feel free fire up the grill and cook yourself a fresh steak as well. Serves: 4 | Prep time: 15 mins. | Cook time: 35 mins. Step 1: Preheat oven or grill to 400°F. Step 2: Add 3 cups peanut oil to a Dutch oven and heat the oil to 335°F. I recommend peanut oil because of its high smoke point (more delicate oils will burn at this temperature). Oil temperature is critical when cooking fries. If the temperature is too low, the fries will be soggy. If it is too high, they’ll burn. You have to have a deep fry thermometer for this—without one you’re setting yourself up for failure. Step 3: Slice cold steak in 1/8 inch thin slices and set aside. It is much easier to get thin slices of steak when the meat is cold. Step 4: Cut potatoes into 1/4 x 1/4 inch strips. Any bigger than this, and the fries tend to get overcooked on the outside and under-cooked on the inside. Step 5: Rinse potatoes and place on a paper towel lined cookie sheet. It is important that the potatoes are dry. If you put wet fries into hot oil it will splatter and potentially burn you. Step 6: Shred Cotija and cheddar cheese, set aside. 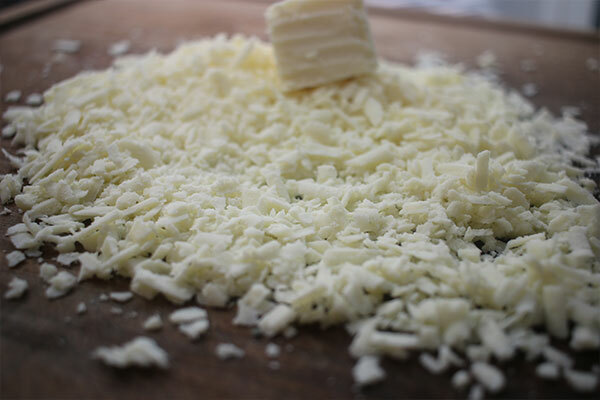 Cheddar will look like normal cheddar when it’s shredded, but cotija cheese sort of clumps up, this is normal. That said, don’t use the pre-shredded cheese, it has a wax coating on it that prevents it from sticking together but also prevents it from melting well. Step 7: Divide fries into four batches. Drop the first batch into the oil and cook 2 minutes. Remove them using a deep fry skimmer. 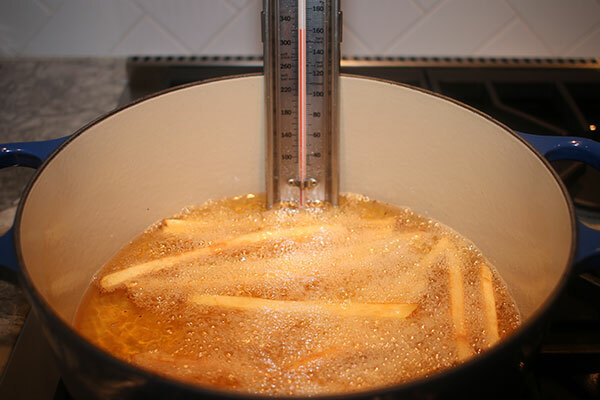 When fries are dropped into the oil, the oil temperature will lower rapidly. This is why we fry each batch twice. 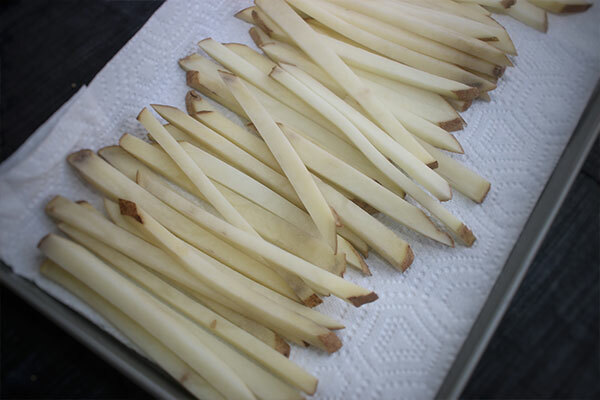 Step 8: Place fries on a paper towel-lined cookie sheet to absorb excess oil. Allow oil to return to 335°F. Place blotted fries back in oil for 4 minutes. Step 9: Remove fries from oil and return them to paper towel lined cookie sheet. Season with 2 tsp of kosher salt. Step 10: Repeat this process with the three additional batches of fries. Keep cooked fries in a warm oven to prevent them from getting cold as you cook the rest. Step 11: Place all fries in a cast iron skillet. Step 12: Top fries with sliced steak and cheese and place in preheated oven. Cook at 400°F degrees for 5 minutes, or until cheese melts. Step 13: Remove from oven. 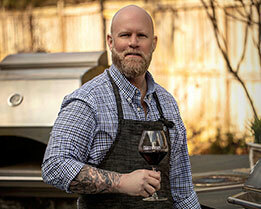 Top with a healthy amount of chimichurri. Add 3 cups peanut oil to a Dutch oven and heat oil to 335°F. Slice cold steak in 1/8 inch thin slices, set aside. Cut potatoes into 1/4 x 1/4 inch strips. Rinse potatoes and pat dry with a paper towel. Shred Cotija and cheddar cheese. Divide fries into 4 even groups. Drop first batch in oil, cook 2 minutes, and remove using a fried food skimmer. 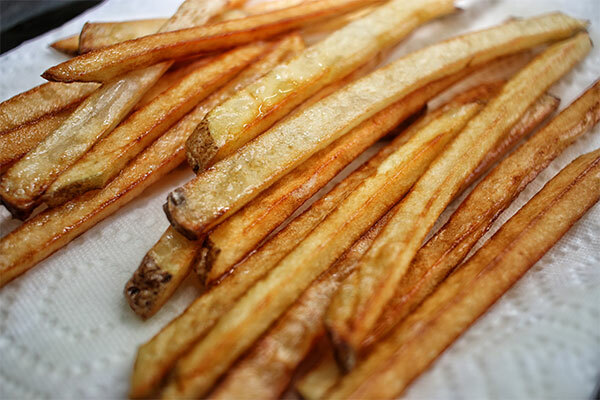 Remove fries and place on a paper towel-lined cookie sheet to absorb excess oil. 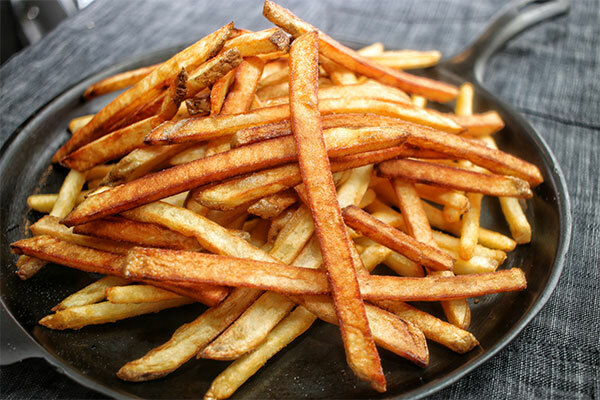 Allow oil to return to 325°F and place fries back in oil for 5 minutes. Remove fries from oil and return them to paper towel lined cookie sheet. Repeat frying steps with each additional batch of fries. As fries come out, place in warm oven. Season with 1 tsp of kosher salt. 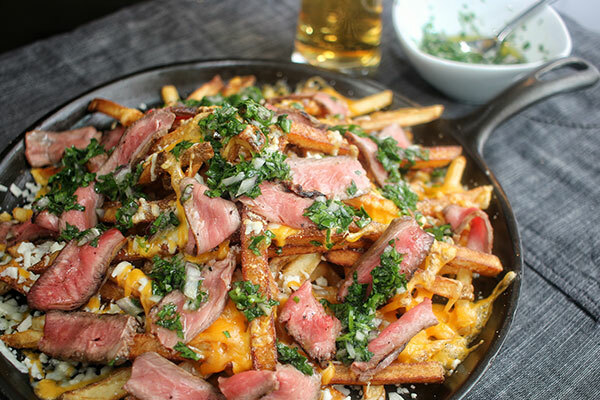 Place fries in cast iron skillet. 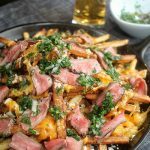 Top fries with sliced steak and cheese and place in preheated oven. Cook at 400°F for 5 minutes, or until cheese melts. Remove from oven. Top with a healthy amount of chimichurri. Serve immediately.